Based on the new understandings on physical mechanisms of silty sediment resuspension that were derived from the previous chapter, more quantitative research works were done in this chapter for getting more parameterization equations and further modify existing theoretical prediction models. The most important works were conducted on the variation of sediment erodibility with the liquefaction degree of seabed by waves. To achieve this goal, a new experimental annular flume system was developed and using which controlled variable experiments were conducted. A new parameterization equation between sediment erodibility and liquefaction degree of seabed was derived and thereafter integrated into the linear erosion model to form a modified erosion model. In situ observational hydrodynamic data from the subaqueous Yellow River Delta were inputted into the modified model and the results were compared with that of traditional one. 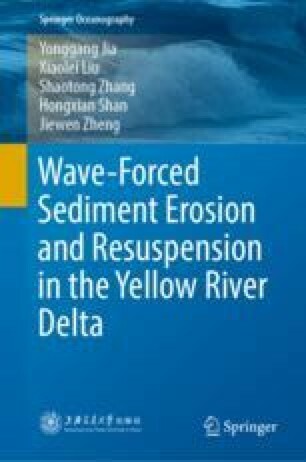 Some improvement in modeling the erosion and resuspension of sediments in the Yellow River Delta was successfully made. Last but the most important, erosion masses and their origins under various hydrodynamics were predicted by the newly modified erosion model.